Emblem of Harakat al-Hawiya al-Arabiya al-Druziya, using the familiar colours associated with the Druze sect. 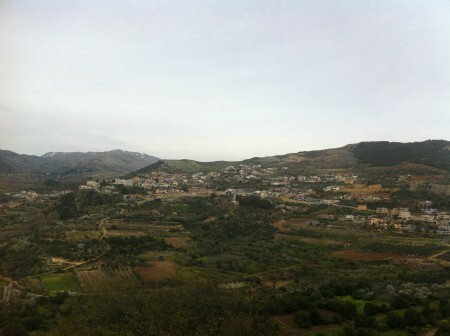 Although the Druze originate from a sect within Shi'i Islam, the religious movement evolved over time such that the Druze identity is deemed separate from that of the Shi'a. The same has been true of the Alawites, though as is well known, a number of efforts have been made in the recent past to bring the Alawites into the fold of mainstream Shi'i Islam, such as Musa Sadr's fatwa in 1974 that recognized the Alawites as Shi'a- a trend of identification strengthened by the post-1979 alliance between the Islamic Republic of Iran and the Assad dynasty. More recently, extensive Iranian and pro-Iranian Shi'a militia involvement on the ground in the Syrian civil war has given rise to claims of further Shi'ification trends targeting the Alawite community in particular, such as the opening of husseiniyas (Shi'i centres) in the Damascus and Latakia areas. Less well known is that allegations of Shi'ification efforts also exist with respect to the Druze community in Syria. It seems that primarily in response to these developments has come the emergence of the Harakat al-Hawiya al-Arabiya al-Druziya ("The Arab Druze Identity Movement"), also known as the Harakat al-Difa' 'an al-Hawiya al-Druziya ("The Movement to Defend Druze Identity"), which first appears to have come on the scene in late 2015 (c. October 2015). Ethnically speaking, the 'Arab' aspect has long been a strong component of Druze identity. Unsurprisingly, given the context in which this movement has emerged, it is highly critical of the regime and those associated with it. However, it is also consistent in its opposition to attempts to alter Druze identity (real and perceived), and so has alsodrawn attention (approvingly quoting independent Druze opposition activist-in-exile Maher Sharf al-Din) to the treatment of the Druze in Jabal al-Summaq in Idlib at the hands of Jabhat al-Nusra, which has not only implemented forced conversions to Sunni Islam but has also confiscated property of those from the area who fled to/live in regime-held areas and are thought to work with the regime, while altering the demographics with an influx of Turkmen people. This contrasts with the reluctance of anti-regime Druze in Lebanon associated with Walid Jumblatt to admit these realities, playing up instead the false idea that some kind of agreement to protect the Druze was reached with Jabhat al-Nusra (a falsehood recently repeated by Fabrice Balanche). "We have avoided until now- out of respect for our Christian people in the Jabal [Jabal al-Druze/Arab: Suwayda' province]- talking about the financed and provocative missionary campaign that some of the churches in Suwayda' are undertaking, exploiting the abundant wealth that has been poured out on them because of the crisis on one hand, and the chronic state of need for aid that many of the families are suffering from on the other...but what the St. George Greek Orthodox church (Suwayda'- Tariq Qanawat) is doing infringes on all ethics of shared co-existence and mutual respect between the Druze of the Jabal and its Christians! For this church and others besides it from the churches in Suwayda' have begun imposing as a condition on the families benefiting from their aid that the children of those families must attend Gospel missionary lessons! And the families that refuse to send their children are barred from the aid! To this degree we have been shown disdain and considered goods for division between one front wanting to 'Shi'ify' us, takfiri movements wanting to 'Sunnify us', and churches whose clergymen- though not daring to raise their heads in the rest of the Syrian provinces- nonetheless in Suwayda' infringe on our identity in this public manner in the heart of our abode!" However, as mentioned above, the movement's concerns at the present time primarily focus on the Shi'ification efforts. A central personality that surrounds this controversy is that of Hezbollah commander Samir Quntar, who was of Lebanese Druze origin and was killed in an Israeli airstrike in the Jaramana area of Damascus in late December 2015, alongside Farhan Sha'alan, a National Defence Force commander in Jaramana originally from the Druze village of Ein Qiniyya in the Israeli-occupied Golan Heights. Sha'alan's Druze identity is not in dispute. The village of Ein Qiniyya (author's photo). 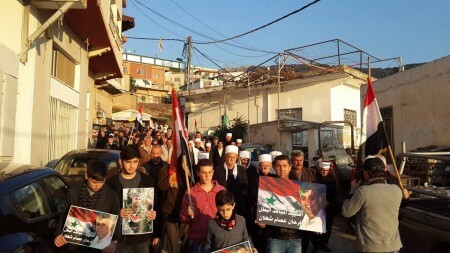 Procession in Ein Qiniyya following the Israeli airstrike in Jaramana: note the focus is primarily on commemorating Farhan Sha'alan rather than Quntar. "The insistence of the regime (and its tools from the mashayakh [al]-'aql and others besides them) on establishing religious and popular mourning for the Shi'i convert Samir Quntar in Suwayda'...comes in the context of conditioning the Druze to the idea of accepting a portion of them converting to Shi'i Islam without being ostracised in society!" The movement attacked Quntar for recruiting Syrian Druze to Hezbollah (who were also allegedly subjected to Shi'ification): "On the neck of the 'Shi'i convert' Samir Quntar is the blood of dozens of Druze youth he recruited in the Hezbollah militia and were killed outside their areas." A somewhat similar position of non-acknowledgement of/disdain for Quntar appears to have been taken by the third-way reformist Rijal al-Karama [and its 'religious/political wing' Mashaykh al-Karama] founded by the assassinated Sheikh Waheed al-Bal'ous. As one member of Rijal al-Karama from Suwayda' put it to this author, "Yes. Samir was Shi'i and he married a Shi'i woman. Everyone in Suwayda' who has karama does not acknowledge him." Besides the eulogies for Quntar, the movement highlights the existence of aShi'ification office in Suwayda' city: "The centre for conversion to Shi'i Islam in Suwayda' city: the name of the office is the Liwa Zain al-Abidain, whose base is on the Tariq Qanawat. And this centre has managed to convert dozens of the Druze to Shi'i Islam. We have come to know two of them from the house of Abu Maghdhab and four from the house of al-Mahithawi. And the names of the rest will be realized soon so that they may understand that betrayal is not a point of view!" The existence of Shi'ification offices, as in the case of the Alawites, is unsurprisingly tied to Iran. As the Rijal al-Karama member said to this author, "There are recruitment offices for the interest of the Iranian Revolutionary Guard in Suwayda' that are calling for conversion to Shi'i Islam." In this context, Harakat al-Hawiya al-Arabiya al-Druziya also refers to a perceived threat from Iranian expansionism to Druze identity: "In the recent years the Iranian project to infringe on the identity of Jabal al-Druze has emerged as one of the most dangerous projects that we face because it wants to adopt through strategy what the rest of the projects were incapable of taking up by force. And in the future we don't know what project of which state we will face, but so long as we are weak and lack the political project it will be suggested to all states that have projects that it will be easy to subject us to affliction!" Relevant to this narrative is the claim by Harakat al-Hawiya al-Arabiya al-Druziya that Iran is trying to alter the demographics of Suwayda' through an influx of Shi'a from the Hawran area in southern Syria, using Christian and Druze real estate agents to sell property and land for the interests of Iran. Politically, where does the Harakat al-Hawiya al-Arabiya al-Druziya stand? To begin with, the group denies that its agenda is particularly religious, but rather that it is aiming to defend the Druze identity as a cultural and civil identity. The group also denies an affiliation with the Rijal al-Karama movement, but it does appear that an associate of Harakat al-Hawiya al-Arabiya al-Druziya is Sheikh Marwan Kiwan of Bayraq Al Kiwan, one of the Rijal al-Karama factions. Indeed, from the beginning he has been approvingly quoted by the group, affirming that "the Khomeinists (replacing the Wahhabis) are the first danger threatening our existential identity, not only culturally speaking...". There is a clear sense of solidarity with Rijal al-Karama elsewhere in the group's posts: for instance, in an attack on a Druze sheikh calledAymenn Zahr al-Din (Abu Khaz'ali), Harakat al-Hawiya al-Arabiya al-Druziya accuses him of promoting Shi'i Islam through providing accommodation to Shi'i proselytizers and taking financial support from Iran, while "establishing a military militia whose sole mission is to stand against the Youth and Mashayakh al-Karama movement!" As for the vision for a future Syria, the movement- like most actors in the Syrian civil war on the rebel and regime sides- rejects the notion of partitioning Syria, but suggests that a federal model of governance might be appropriate. In terms of its activities, the evidence would suggest that while the movement is present on the ground in Suwayda' (something corroborated by the Rijal al-Karama member), it is still in a nascent stage and not able to mobilize in order to organize demonstrations or form a militia wing. Accordingly, the group's significance as a political actor should not be overstated, but its existence does highlight some real Syrian Druze concerns of Iranian-led attempts to Shi'ify their identity- a trend worth monitoring for the future as a potential popular grievance alongside conscription avoidance and concerns regarding corruption and services provision for more third-way Druze actors to exploit. "It is possible that there is a pull towards conversion to Shi'i Islam but it is not in open form. Through a number of means: in recent times there has been the spread of Shi'i songs and nasheeds in [one] way. There has been the purchase of lands of the province and it has come to us that that it is for people outside Suwayda' affiliated with Iran. There was an attempt some time ago to build a husseiniya. The recruitment of a number of youth of the province in Shi'i militias like Liwa Abu al-Fadl al-Abbas, frequent visits by Shi'i religious men to Suwayda'. These are clear matters and God knows what is hidden. But my information about this situation is weak." "From the nationalist perspective, Quntar resisted Israel in the past and was held as a prisoner in its prisons. But in the ongoing war in Syria, he joined with the Shi'a against the Sunnis and perhaps he had a role in encouraging conversion to Shi'i Islam among the ignorant [i.e. non-religious] Druze youth. From the religious perspective, Samir was married to a Shi'i woman and was therefore outside our religion." "We are not against the Shi'a, Sunnis,Christians or any religion. All religions are for the worship of God. But we are against anyone who attacks us or leads us to conflict with sect against sect. With regards to Shi'ification, it does not have an effect on us. He who wants to become Shi'i, let God make it easy for him." So, to emphasize as before, this issue of Shi'ification in Suwayda' is still a matter of some controversy and does not yet rank with conscription avoidance and concerns regarding corruption as a focal point of popular anger and resentment. It is nonetheless a trend worth keeping an eye on for the future, having the potential to increase the influence of actors like Harakat al-Hawiya al-Arabiya al-Druziya and influence the agenda of the likes of Rijal al-Karama.